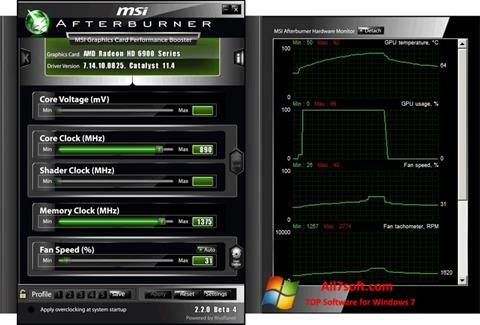 MSI Afterburner for Windows 7 - a set of tools for overclocking and tuning the performance of a video card. The application functions in the background, supports interface changes, allows you to monitor the operation of the kernel and video memory in real time. The utility is able to read the parameters of the cooling system, temperature and current-voltage characteristics, allows you to change the core frequency and speed of rotation of the coolers, save and load configuration options through keyboard shortcuts. The program includes a number of synthetic tests, the ability to record video from the monitor screen and display the current fps in games. You can free download MSI Afterburner official latest version for Windows 7 in English.